A professional project developer and consultant. Planning and consulting for small and medium scale enterprises. Planned trainings for small and medium enterprise operators. On-going volunteering since moving to Ireland; as a member of the Board of Directors for Lourdes Pre-School (2010 – 2011); as a member of the Board of STRIDE Ethiopia, facilitating communication; as a volunteer with Value Added in Africa, sourcing African products to be marketed in Ireland by collecting suppliers’ information and developing relationships. 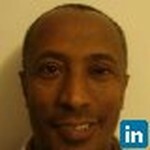 Join Today to follow and contact Kumilachew A. Abebe.